This academic presentation is filled with errors, though it’s funded by the Victoria University of Wellington and the Royal Society—which means your taxes, at least in part. Just now I want to comment on one slide (No. 14) that appears to claim that almost all scientists believe that anthropogenic global warming is caused by mankind. This is the slide. It illustrates the malignant “climate consensus” that poisons most popular discussion on climate policy. Mere disagreement of even thousands of people won’t create warming if the temperature has been falling. It matters little whether they’re scientists or not. But the very mention of a consensus inhibits the examination of evidence—and even armed with evidence it still takes a brave man to disagree with “97 per cent of scientists.” So claiming a consensus, even if it doesn’t exist, can be an effective ploy. For convenience and a kind of shorthand there may well arise a consensus on some scientific topic, and it often happens, but though the truth in science might create a consensus, no consensus ever established a scientific truth. Being an advocate of science seems to mean nothing more than shouting as loudly as possible ‘what science says…’, second hand. And those who shout most loudly about science turn out to be advancing an idea of science which, rather than emphasising the scientific method, puts much more store — let’s call it ‘faith’ — in scientific institutions. Hence, the emphasis on the weight, number and height of scientific evidence articles, and expertise, rather than on the process of testing competing theories. This road-show presentation is, as I said, full of errors. But when I received it recently what stood out for me was that Professors Renwick and Naish cite a number of research papers that have been comprehensively invalidated. This is a major mistake. If they are unaware of the faults revealed in these papers by subsequent research then they cannot have been diligent. If they are aware of them, they should at the very least have mentioned that the papers are controversial. To present them to the lay public as good science is a perversion of their academic authority. For these papers are scandalous. The paper Quantifying the consensus on anthropogenic global warming in the scientific literature is the infamous study by John Cook et al. that is widely disparaged for its fatal and particularly egregious errors. It’s hard to understand why anyone familiar with the paper would cite it or why anyone would cite it who was not familiar with it. Unless they were desperate for support and didn’t care where they found it. Surely no reputable academic would cite these studies. They purport to prove a consensus of almost all climate scientists but either use a weak definition of consensus that most would agree with or their samples of papers or survey respondents are unreasonably small. For a solid analysis of Oreskes (2004) see Christopher Monckton (2007). Oreskes does not reveal how many papers explicitly endorsed her watered-down consensus, but subsequent research found that only 1% explicitly endorse that consensus—not 100%. An excellent dissection of the execrable Cook et al. (2013), by Paul Homewood, is available at Not a lot of people know that. An earlier paper by David Legates et al. (2013) showed that Cook et al’s claimed consensus of 97%, when measured correctly from their own data, was in fact only 0.3%. This one slide we’ve discovered being foisted on amateur audiences around the country during yet another junket funded from your taxes would be enough on its own to dismiss Profs Renwick and Naish’s specious arguments that we’re destroying the climate and laugh them out of town. Unfortunately this slide is just one of 49. Watch this space. Here are the studies cited in the presentation that claim some level of consensus concerning climate science, with papers that contradict them (including the two references given above in the post). I’ve found some errors not mentioned in the original post, above. Verheggen (2014) — Authors and lead authors associated with the IPCC appear strongly represented in this sample, and they could reasonably be expected to believe strongly in dangerous man-made global warming, as it’s the subject they’re writing about, but whether that slants their results I don’t know. It seems to be a high-quality paper. I’ve found no rebuttals. Stenhouse (2014) — Surveys the American Meteorological Society (26% response) and provides a limited view. Q4 Do you think human activity is a significant contributing factor in changing mean global temperatures” (Question displayed only if respondent thinks temperatures have risen). Q3 When compared with pre-1800’s levels, do you think that mean global temperatures have generally risen, fallen, or remained relatively constant? We find that 93.48% answered Yes, and you can calculate that 96.66% of 93.48 is 90%. So the paper provided the data for the correct calculation to be made but for some reason inflated the answer. The correct number of respondents was 90% but our road-show presenters incorrectly show 97%. Professors are not allowed to make a mistake as large as 7%. Their skill with percentages is presumed to be perfect. I cannot avoid the impression they were trying to mislead us. Shame on you, sirs. I have to say this list of papers is persuasive only by repetition of 97% and similar numbers because on close inspection their errors make each paper singularly unimpressive. More drab and humdrum than gripping. It is essential, Richard T, that the proponents of AGW know that their views (faith?) are constantly reaffirmed, and being assured that there are many of the same point of view is one such example. It is akin to what I understand of the concept of midrash in Hebrew teaching—in the stories of the Old Testament. For example it wasn’t Moses alone who parted the waters for the people to cross. So did Joshua part the waters of the Jordan to enable his army to cross. Not only did Solomon build a temple. So did Zerubbabel, and later, Herod. Even Elijah saw a temple built in a vision. My understanding is that by repeating the stories the Rabbis were reminding the people that Jehovah was still with them. It was a reaffirmation of the interest of the Almighty in His chosen people. Do I detect a necessity in the proponents of AGW (or should that now be ACC—and no I am not referring to compensation!) for such reaffirmation. Surely the evidence of the last nearly 30 years must be shaking their very foundations. The topic of consensus has been well dealt with by various critics—you’ve cited Curry, Pile, Monckton, Homewood and Legate. The most telling comments, though, probably come from the past. Einstein is reported to have said of his theories that any number of experiments would never prove him right, but that it would take only one to prove him wrong. He is also supposed to have asked, when informed that a committee of something like 100 had been set up the challenge his general theory of relativity, “Why so many? It needs only one!” Perhaps his challengers were seeking safety in numbers? Doesn’t that sound like the need for a consensus? Richard, you have cited one slide from the “Ten Things” traveling road show. A slide preceding it, asking the question “Did you know … That Scientists are almost 100% convinced that warming is human induced?”, is possibly the most egregious of all 49 slides in the road show presentation. The whole presentation is a mishmash of misleading, overstated, and just plain incorrect information. This one in particular tries to mislead because it avoids the term “consensus”. What scientists? Almost 100%? It doesn’t infer a consensus which might be challenged (such as the Oreskes and Cook papers). Does it mean that almost all scientists are convinced? Or does it mean that just some scientists are almost convinced? I am sure it is intended to confuse the listener. I have to wonder why! Phew! Nice to see you here! You take my breath away! Frankly, I wonder if the biblical references are appropriate or useful in the context, but I don’t want to discourage you. If they help you visualise the climate debate, carry on. I agree that our views on any subject are an expression of faith. Even waiting for the bus is an expression of faith. You’re quite right that every group looks for confirmation and I guess it’s the scientific path that is the loneliest and the best. It’s certainly science that we wish to discover and to promulgate here. It’s great to have your help! I used the Biblical references, not because I am religious—far from it, although I will own up to being a Freemason (which is not religious, just in case someone objects! )—but because I find it the easiest way to explain what I can only consider to be “blind faith”. In my opinion probably the best way to fight such “faith” is by quietly undermining it with simple facts expressed in such a way that everyone can easily understand them. 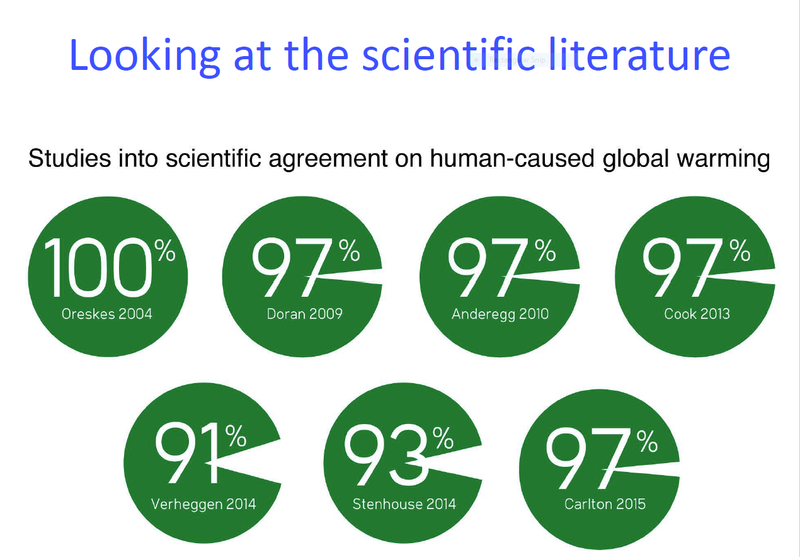 So what proportion of climate papers and/or scientists state that anthropogenic climate change is occurring? Show us some peer-reviewed studies that claim less than 90%. Consensus is completely relevant, until the paradigm is broken by proven study. CO2 is a greenhouse gas. CO2 is increasing in the atmosphere. Global temperatures are increasing as a result. All of these statements are true. A little proof would be extremely useful and would add to our knowledge. You are quite correct that carbon dioxide is a greenhouse gas and that it is increasing in the atmosphere. But perhaps you might like to reveal the incontrovertible, physical evidence that it is causing global temperatures to increase as a result. 2) Is downwelling longwave radiation (IR-C, DLR) a surface material heating agent? No, The net LW flux is UP (-52.4 W.m-2) from the surface i.e. a COOLING flux of outgoing longwave radiation (OLR). The CO2 component of DLR is only about 2% (7/345.6) and the change since 1976 only about 1 W.m-2 i.e. 0.3% (1/345.6). This is negligible. And DLR only penetrates the ocean surface by a max of about 100 microns. This is about the thickness of a human hair. If Naish and Renwick think there is a heat transfer from air-to-surface or air-to-sea (as the IPCC speculates), then they are subscribing to a violation of the Clausius statement of the Second Law of Thermodynamics and run contrary to IPCC observations and energy budgets. The IPCC went looking for their “air-sea fluxes” in Chapter 3 but they should have known it was a fools errand, as it turned out to be, if they had just looked at their own cited earth’s energy budget (see ‘IPCC Ignores IPCC Climate Change Criteria’) – there is NO air-to-surface heat transfer by sensible/latent heat or radiation. The radiative energy transfer is UP from the surface (-52.4 W.m-2). 5 Ninety-three per cent of the heat ………….. from humankind’s use of fossil fuels has gone into the ocean. This is an outright fabrication (a lie). The IPCC only speculates on this in Chapter 10 Detection and Attribution i.e. attribution by speculation. They have no science whatsoever to support their speculation. The IPCC went looking for their speculated “air-sea” fluxes in Chapter 3 but could not find them. Pointless to look because the earth’s energy budget they cite does not have any net LW flux into the ocean so there cannot be an air to sea heat transfer (and see 2 above). Naish and Renwick are scientific phonies and they are touting scientific fraud – they are either totally inept or charletans. They’re being PAID to tout their scientific fraud by a university and a society. Molecules of carbon dioxide (CO2) can absorb energy from infrared (IR) radiation. This animation shows a molecule of CO2 absorbing an incoming infrared photon (yellow arrows). The energy from the photon causes the CO2 molecule to vibrate. Shortly thereafter,  the molecule gives up this extra energy [/1] by emitting another infrared photon.Once  the extra energy has been removed [/2] by the emitted photon, the carbon dioxide stops vibrating. CO2 an effective heat-trapping greenhouse gas. [Title] and ,  and  describe energy TRANSFER – not “trapping” as stated in . There is NO energy “trapped” in this process whatsoever, the energy has simply been transferred. Therefore, CO2 is an effective and passive energy TRANSFER medium contrary to ..
UCAR are peddling bunk as “science education”. Which might explain why the NSF dissociates itself in the disclaimer. Yes you sure have misunderstood RT. The UCAR article is specifically in respect to the CO2 molecule absorbing and emitting – nothing else. Nothing at all about what you extrapolate from it. I don’t know how you make the leap you’ve taken. Note too upthread that it is not just me that sees the utter falsity of the CO2 “heat trapping” notion. “This ability to absorb and re-emit infrared energy is what makes CO2 an effective heat-trapping greenhouse gas. The first element “this ability to absorb and re-emit infrared energy” contradicts the second “makes CO2 an effective heat-trapping greenhouse gas”. 1. To catch in a trap; ensnare. 2. To prevent from escaping or getting free: was trapped in the locked attic. 4. To seal off (gases) by a trap. Clearly “transfer” is NOT “trapping”. UCAR certainly is “peddling bunk”. excited electron states – from milliseconds to tenths of seconds. 0.1 microseconds – so, many collisions and efficient energy transfer. Transfer by radiation is in the order of “milliseconds to tenths of seconds”. No change in air temperature results because CO2 is simply a passive transfer medium. Too invoke radiative energy transfer as determining temperature at any altitude is not only redundant but fallacious. The entire temperature profile of the atmosphere (surface to TOA) is determined WITHOUT recourse to radiative transfer as I’ve shown upthread (see “Greenhouse Equation”). The US Airforce Labs first modeled the atmospheric temperature profile from surface to TOA (see Satzer above, page 10) in 1958, revisions l1962, 1966, and the final version 1976 (see below), WITHOUT recourse to radiative transfer. The only radiative input is the solar constant (see “Greenhouse Equation” upthread). James Clerk Maxwell FRS FRSE (13 June 1831 – 5 November 1879) was a Scottish scientist in the field of mathematical physics. His most notable achievement was to formulate the classical theory of electromagnetic radiation, bringing together for the first time electricity, magnetism, and light as manifestations of the same phenomenon. Maxwell’s equations for electromagnetism have been called the “second great unification in physics” after the first one realised by Isaac Newton. Written by Alex Newman, New American on July 15, 2016. It’s not your grandfather’s Democrat Party anymore. In fact, it’s not even your father’s party anymore. With the powerful Democratic Party Platform Committee featuring a number of prominent socialists and communists, the Democrat Party’s draft platform has moved further toward full-blown extremism and totalitarianism than ever before. Indeed, the proposed platform now includes an unprecedented array of extreme anti-constitutional proposals practically guaranteed to alienate mainstream Americans — at least if the public finds out. From tax-funded abortion worldwide and banishing millions of Americans from the workforce with a $15-per-hour minimum wage, to empowering a United Nations “climate” regime and prosecuting skeptics of the man-made global-warming theory, the Democrat Party’s latest guiding document reads almost like a parody concocted by Republicans to make their rivals look ridiculous. An examination of the extremists sitting on the body that drafted the agenda, though, helps explain how one of America’s two main parties could have openly moved so far to the fringes in such a short time period. 7 meta-studies claiming in excess of 90% scientific agreement on human caused global warming. Please cite a meta-study that suggests otherwise. Only one peer-reviewed paper is cited (Legates et al. (2013)) and it is a critique of the Cook paper. If you are unable to cite a contradictory independent study, literature review, or meta-analysis; then Slide 14 must be valid. I look forward to your analysis of other ‘erroneous’ slides. Simon is not arguing science, he is arguing ideology. He himself cites a contradictory review (Legates et al. 2013), then immediately dismisses it. He is utterly unaware of his thoughtlessness, in determined pursuit of a false certainty. He is a liar, to himself above all. And he is representative of all who cling to the “global warming” alarmism as their faith. It’s not a consensus of opinion either, but empirical evidence from 4 sources – a consensus of empirical evidence if you like. Talk about a meta-study—with impeccable credentials! Nice one. Do you fully support these papers, with their methodologies and assumptions? Do you accept their conclusions with no reservations whatsoever? Please consider the potential effects on your own credibility before answering. A peer review is not required for a paper to be published, logical, correct, refuted or even to be read. Lack of a peer review is no refutation so you have to provide some argument against it (read it first). But I’ll append rebuttals for the other erroneous papers. There is a new paper out that summarises the histories and flaws of the consensus papers. Completely ineffective as such during the latest El Nino apparently. Climate scientists Gavin Schmidt, Stefan Rahmstorf, Steven Sherwood, Micheal Mann, and the UK Met Office all claimed the bulk of the El Nino spike for AGW/MMCC. All are now being proved wrong by temperatures returning to neutral. The oceanic El Nino heat has simply been transferred (not “trapped”) by the troposphere (including “greenhouse” gases) to space in accordance with the Kelvin-Planck statement of the Second Law of Thermodynamics which in essence says the excess energy is expelled to a heat sink (space in the El Nino case). The latest El Nino falsifies the “heat trapping greenhouse gas” notion, and makes the above climate scientists look like idiots. Do you REALLY want to subscribe to their idiocy Simon? No energy is “trapped” in this absorption-emission process. The energy is TRANSFERRED. For CO2 in the troposphere the animation should show some molecular excitation in the initial and final state rather than the zero excitation shown (O Kelvin temperature). The temperature of the lower mid troposphere is 273 K i.e. molecular excitation. In the context of the atmosphere, the initial and final state of the molecule is the ambient temperature at whatever the altitude of the air mass containing the molecule, technically Local Thermodynamic Equilibrium (LTE). The ambient temperature of air at EVERY altitude in the standard atmosphere is calculated by the “greenhouse equation” (see below) but without recourse to any “greenhouse” or radiative effects except for the solar constant and Stefan–Boltzmann constant. It is impossible to reproduce the entire atmospheric temperature profile from within the “heat trapping greenhouse gas” paradigm. T is the initial and final temperature of the CO2 molecule in the UCAR animation above. Note that there is NO recourse whatsoever to “heat trapping greenhouse gas” effects (CO2 occurs only in “m = average molar mass of the atmosphere” i.e. as a constituency). The Stefan–Boltzmann constant is the constant of proportionality in the Stefan–Boltzmann law: “the total intensity radiated over all wavelengths increases as the temperature increases”, of a black body which is proportional to the fourth power of the thermodynamic temperature. Not true when I look at this again. I was referring to CO2 absorption and re-emission (“radiative energy transfer”) being termed “heat trapping” by UCAR i.e. a miss-characterization. Obviously the Stefan–Boltzmann constant is “recourse to radiative transfer” – my bad. Stirling, Michelle, Consensus Nonsensus on 97%: Science is Not a Democracy (July 10, 2016). A number of scholars who have previously undertaken studies on the alleged ‘consensus’ of the human impact on global warming have recently published a paper (Cook et al. 2016) which they claim confirms and strengthens their previous 97% consensus claims. This author rejects their findings and deconstructs both the premise of the relevance of consensus in the empirical evidence-based world of science and finds the claims are in fact ‘nonsensus.’ Several of the scholars’ consensus claims and those of scientific bodies were published prior to the 2013 IPCC Working Group I report wherein it was reported that there had been a hiatus in global warming for some 15 years (to 2012), despite a significant rise in carbon dioxide from human industrial emissions. Yes, plenty. Also ‘gateway belief model’ is an interesting concept (just belieeeeeve……pleeeeease……). Interesting though is that Michelle Stirling shows the drop in solar activity after 2006 in Figure 3 page 16. The observed TOA energy imbalance according to IPCC Chapter 2 citation was only +0.6 W.m-2 2000 – 2010. Solar activity (Minimum) has dropped at least 0.26 W.m-2 since 2006 – 2015 in Fig 3. Probably more by other measures e.g. integral. Theoretical CO2 forcing per decade this century is only about +0.3 W.m-2/decade. If this forcing was valid and the total effective theoretical anthropogenic radiative forcing was valid, the earth’s energy imbalance SHOULD be at least +2.33 W.m-2 and increasing – it isn’t. This doesn’t mean that solar change has diminished the earth’s energy imbalance to +0.34 W.m-2 but it certainly means that an updated earth’s energy imbalance will be altered in some way. We will have to wait and see what the effect is. This does mean that theoretical anthropogenic climate forcing is invalid. Outgoing radiation (OLR) from the El Nino will obscure this picture, as will a following La Nina. It will probably be at least the end of 2018 before we see neutral conditions again. And that’s if there’s no further ENSO activity. Abdussamatov (2012) below says the earth is now in “energy deficit” relative to Modern Maximum solar levels but it wouldn’t surprise me if the TOA radiative imbalance change is minimal. The IPCC assumption is that the budget should be in balance (i.e. 0 imbalance) but there’s no justification for that given the enormous amount of heat stored in the oceanic heat sink and the delay the ocean adds to the sun => ocean => atmosphere system (ocean adds “10 -100 years” – Trenberth). the extraordinary personal cost of dissent, especially when an issue is moralized. Gonzalez, G. A. An eco-Marxist analysis of oil depletion via urban sprawl. Environ. Polit. 2006, 15, 515−531. Entman, R. M. Improving Newspapers’ Economic Prospects by Augmenting Their Contributions to Democracy. Int. J. Press- Polit. 2010, 15, 104−125. Harribey, J. M. The unsustainable heaviness of the capitalist way of development. Pensee 2002, 31 − +. Delmelle, E. C.; Thill, J.-C. Urban Bicyclists Spatial Analysis of Adult and Youth Traffic Hazard Intensity. Transp. Res. Record 2008, 31−39. Howard, C.; Parsons, E. C. M. Attitudes of Scottish city inhabitants to cetacean conservation. Biodivers. Conserv. 2006, 15, 4335−4356. McCright, A. M.; Dunlap, R. E. Cool dudes: The denial of climate change among conservative white males in the United States. Glob. Environ. Change-Human Policy Dimens. 2011, 21, 1163−1172. The number of authors of such papers in the survey responses is unknown, and is unknowable given the failure to log the specific fields of all respondents. This invalidates most of the reported findings. The paper should be withdrawn and the correct figures reported when available. climate change to frame an engineering project. However, most engineering papers do not mention climatethose authors will not be surveyed. Thus, the views of most “mitigation” researchers cannot be contested. An “eco-Marxist analysis” is part of a 91% “consensus” of attribution of global warming to human cause. Psychologist José Duarte writes: The Cook et al. (2013) 97% paper included a bunch of psychology studies, marketing papers, and surveys of the general public as scientific endorsement of anthropogenic climate change. Let’s go ahead and walk through that sentence again. The Cook et al 97% paper included a bunch of psychology studies, marketing papers, and surveys of the general public as scientific endorsement of anthropogenic climate change. I only spent ten minutes with their database — there will be more such papers for those who search. I’m not willing to spend a lot of time with their data, for reasons I detail further down. This paper is vacated, as a scientific product, given that it included psychology papers, and also given that it twice lied about its method (claiming not to count social science papers, and claiming to use independent raters), and the professed cheating by the raters. It was essentially voided by its invalid method of using partisan and unqualified political activists to subjectively rate climate science abstracts on the issue on which their activism centers — a stunning and unprecedented method. I’m awaiting word on retraction from the journal, but I think we already know that this paper is vacated. It doesn’t represent knowledge of the consensus. Many warmists cite Tyndall’s 1861 experiment as “proof” of the catastrophic anthropogenic global warming theory, but in fact the experiment demonstrated only that CO2 and H2O are IR-active molecules capable of absorbing and emitting infrared radiation, nothing more. Of course, CO2 does indeed absorb and emit very low-energy ~15 micron infrared radiation, equivalent to a “partial blackbody” at a temperature of 193K (-80C) by Wien’s Law. However, radiation from a true or “partial” blackbody cannot warm the much warmer atmosphere (with an “average” temperature of 255K (-18C), equivalent to the equilibrium temperature of Earth with the Sun), nor the even warmer Earth surface at 288K (15C). Yet the Arrhenius radiative greenhouse theory falsely assumes that “backradiation” from the 193K CO2 “partial blackbody” can warm the Earth surface temperature from the 255K equilibrium temperature with the Sun by 33K up to 288K. This would require a continuous and dominating heat transfer from cold to hot, thus requiring an impossible decrease of entropy, and therefore a gross violation of the Second Law of Thermodynamics (which requires entropy to increase from any transfer of heat). Furthermore, as physicist William Happer points out [hotlink], the probability of CO2 transferring quanta of energy in the troposphere via collisions instead of emitting a photon is one billion times more likely. This transfer of energy via collisions to the remaining 99.06% of the atmosphere causes acceleration of convective cooling by increasing the adiabatic expansion, rising, and cooling of air parcels. Convection dominates radiative-convective equilibrium in the troposphere by a factor of ~8 times and thus cancels any possible warming effect of the low-energy CO2 backradiation upon the surface. Further, the presence of IR-active gases in the atmosphere only delays the ultimate passage of IR photons from the surface to space by a few seconds, and is easily reversed and erased during each 12 hour night, and explains why ‘greenhouse gases’ don’t ‘trap heat’ in the atmosphere. Even a Luke-warmer position is untenable in this onslaught. Richard C: “That difficult huh?”. Now! Now! Richard, sarcasm does not become you 😉. We do have to remember he is a poor, struggling, academic who is just trying to support himself in a world where (horror of horrors!) the “science is settled” and there is no need to keep devoting money to determining it (witness CSIRO). Of much more import to me is Figure 1 of Michelle Stirling’s paper (Consensus Nonsensus) which is sourced from Spencer and Christy (UAH). I haven’t gone looking for the original (Richard T thinks there is an updated version with later data) but that doesn’t lessen Stirling’s representation. The figure shows the evolution of the consensus papers with their dates shown on a plot of temperatures from model predictions and actual data (satellite and balloons). I am unable to display it here, but for those who haven’t seen it and would like to I have uploaded it to my web site for quick access. It can viewed at this URL http://kerkin.co.nz/weather/stirling.png. The import of the figure is simply brilliant. What stands out like the proverbial is that any sort of consensus is totally irrelevant because the time evolution shows that those supporting the consensus haven’t got it right yet. I would argue that they never will while the underlying hypothesis remains just plain wrong. Almost as soon as the news broke that 2015 was the hottest year in the modern record, the conversation quickly turned to how much of the record-breaking warmth was down to climate change and how much to the Pacific weather phenomenon known as El Niño. Apparently the “heat trapping greenhouse gases” didn’t “trap” the heat after the 2016 Feb peak. Most of which was “due to human-caused global warming” according to Rahmstorf. Temperatures are now on the way back to neutral according to the Kelvin-Planck statement of the Second Law of Thermodynamics (excess heat expelled to heat sink). So now Schmidt Scaife Cropper and Rahmstorf, among others, all look like idiots. Worse, the Man-Made Climate Change (MMCC a.k.a AGW) conjecture is being falsified by the GISTEMP temperature data after the 2016 Feb peak. Embarrassing for Schmidt and Scaife in particular. Neutral is below the UKMO’s blue forecast range and only just in the lower green CMIP5 forecast range i.e. the neutral trajectory (flat) takes the observations out of the model forecast range whether UKMO Decadal or CMIP5. We are witnessing the abject failure of the anthropogenic global warming theory. Richard C, the “confidence grows as the models get worse” is akin to my view of why a consensus is required: reaffirmation of a faith. (If others agree with me, I must be right – post hoc ergo propter hoc). Simon’s “misunderstood figure” reference is another example of someone scraping the bottom of the barrel to try to find some small iota of justification. Arguing about placement of baselines, vertical scales, scatter of models, inconsistencies of smoothing, and structural faults is just playing with words. Of course any system of smoothing using, say, 5 year rolling averages will have inconsistencies at one end or other. If the period of smoothing is 5 years there will be periods of 1, 2, 3, and 4 years either at the beginning or at the end. To make such a criticism is trivial carping. The data from satellites and balloons at the University of Alabama, Huntsville is highly regarded and to suggest it has “structural faults” without precisely detailing what those faults may be is unfair and possibly insulting. I’m still waiting for Simon’s incontrovertible physical evidence that carbon dioxide is the cause of global temperature rise. This is neither satellites, nor Spencer, nor Christy. It’s UKMO (Probably from one or some of Smith, Eade, Dunstone, Fereday, Murphy, Pohlmann, and Scaife. Maybe other names now but Scaife’s still there), HadCRUT, NASA GISS and NCDC (NCEI now). Shortcomings accepted. The smoothing problem in Figure would be the 2 yr period at the end of the series 2014/2015. They need another 2 yrs at least, 3 or 4 would be good. However, 5 yr smoothing would be appropriate in Figure 3 because climate models don’t do ENSO i.e. they are not comparing apples-to-apples without smoothing. Their projection is from the top of an El Nino spike, fergoodness sakes! They don’t regard the 2015/16 El Nino as a natural phenomenon, therefore, they make their CO2-centric projection from the top of a data spike they regard as man-made (all but “a few hundredths of a degree”). This is a recipe for egg on face. I would not have thought Figure 1 in conjunction with Figure 5 would have been very encouraging but they’ve persevered. Didn’t do so well each year until their end of 2014 forecast when they finally got super lucky with a big El Nino in 2015 (Woo Hoo !!). But they’ll be back in egg-on-face serial failure mode at the end of this year again. Their next forecast will have to be from the BOTTOM of the El Nino data – not the top. Worse, there’s a La Nina forecast to develop during August – October this year……..
17 July 2016 – In Atuncoya and Cachipascana cold kills. Extreme cold in Puno. Temperatures reaching 15 degrees below zero. 13 children under five have died in the Puno region from April to date. 19 thousand hectares of crops have been ruined by hail and bitter cold. More than 18,000 animals have died. Peru is a Non-Consensus zone apparently.. In fact, the authors of the papers referred to in their Slide 14 do not say that all climate change is ‘human-caused’ anyway. Some man-made greenhouse gases have contributed, and that is agreed on all sides if the climate debate. Not so in terms of radiative warming it’s not agreed. That is only agreed upon by Warmers and Lukewarmers.The Slayers don’t agree, the Hockey Schtick doesn’t agree. I don’t agree. The US Standard Atmosphere Model doesn’t agree, The earth’s energy balance doesn’t agree and that’s the IPCC’s primary climate change criteria i.e. the IPCC cannot agree by their own climate change criteria despite their attribution statements. The only agreement by those is that greenhouse gases contribute simply by being an atmospheric constituent. Even then the US Standard Atmosphere Model neglects insignificant trace gases, CO2 included. GHG’s are thermalised by mass, gravity, pressure, solar input etc, After that, GHGs are merely passive heat transfer mediums. How can that possibly “contribute” to climate change of any sort? Q: Why is Antarctica cooling down? The Antarctic Peninsula experienced rapid warming from the early 1950s to the late 1990s, but that warming has paused as the peninsula cools instead. New research from British scientists found stabilisation of the ozone hole, changing wind patterns and natural variability have caused the peninsula to enter a temporary cooling phase. This is a really interesting new study and confirms the conclusion of earlier research – cited in the news and views, that the 20th and 21st century warming trends in west Antarctica were not unusual in the context of natural climate variability of the last 2000 years. Natural climate processes that control the timing and strength of the El Nino Southern Oscillation and the Southern Annular Mode are thought responsible for the variability. This new paper focuses specifically on the temperature records of the Antarctic Peninsula, which has often been referred to as a “global warming hot spot”. So while some sceptics may see this paper as an apparent “debunking”, the Intergovernmental Panel on Climate Change (IPCC) made it clear that, unlike the Arctic, overall Antarctica had not warmed any faster than the global average temperature increase since the mid-20th century, and that regional rapid warming observed on the Antarctic Peninsula could not be attributed to anthropogenic global warming. The message is that this is not a surprise, that amplified warming of Antarctica is expected and is predicted as greenhouse concentrations increase. Ah yes, “the message” – it is “temporary”. Cooling is just a warming “pause”. Our findings cover only 1% of the Antarctic continent and emphasize that decadal temperature changes in this region are not primarily associated with the drivers of global temperature change but, rather, reflect the extreme natural internal variability of the regional atmospheric circulation. But I’m flabbergasted that his wording strongly implies when he refers to “West Antarctica” that he means continental Antarctica. It’s an egregious misdirection. The paper does not contain the word “temporary” and gives no indication of the future of temperature on the AP. In other words, it does not justify the word “temporary” in the Stuff headline—though future temperature rise is not ruled out. It’s worth repeating the following from the end of the letter. As you’ll see, though their studies found no evidence for it, they echo model claims of future warming. The start of the AP cooling in 1998 coincided with the so-called ‘global warming hiatus’. There has been extensive discussion over the factors responsible for this reduction in the rate of increase in mean global SAT [surface air temperature], with the negative phase of the IPO, volcanic and solar activity, and aerosol forcing being cited as possible causes. As discussed earlier, the phase of the IPO can affect the climate of the AP, but the negative phase is usually associated with higher SATs during the extended winter. Since the late 1990s, AP SATs have decreased throughout the year, with local factors playing a greater part than tropical variability, indicating that the absence of AP SAT warming is independent of the global warming hiatus. The recent change in SAT trend can be set in a longer-term perspective through examination of regional ice core records. An ice core from James Ross Island (Fig. 1), which is close to Marambio station, showed that the region experienced several periods of rapid warming and cooling in the last 1,000 years, and that the warming trend over the last 100 years was ‘highly unusual’, although not unprecedented. However, the period since the late 1970s includes the ozone hole, which is unique in the record. The Ferrigno ice core from the coast of West Antarctica (Fig. 1) shows a warming from the 1950s to the early twenty-first century that agrees well with the warming observed at Vernadsky. In the longer term, this record revealed marked decadal variability and, importantly, resolved a 50-year period in the eighteenth century when SATs increased at a faster rate than observed at Vernadsky over the second half of the twentieth century. Such long-term variability is also expected from analysis of station SAT records, which exhibit statistical long-term persistence. Therefore all these studies suggest that the rapid warming on the AP since the 1950s and subsequent cooling since the late-1990s are both within the bounds of the large natural decadal-scale climate variability of the region. This result is also consistent with the very high level of decadal-scale natural internal variability of the regional atmospheric circulation seen in long control runs of climate models. Climate model projections forced with medium emission scenarios indicate the emergence of a large anthropogenic regional warming signal, comparable in magnitude to the late twentieth century Peninsula warming, during the latter part of the current century. [Sentence 3] “Climate model projections forced with medium emission scenarios indicate the emergence of a large anthropogenic regional warming signal, comparable in magnitude to the late twentieth century Peninsula warming, during the latter part of the current century. The “large anthropogenic regional warming signal” in the models is irrelevant. The attribution is “decadal-scale natural internal variability” – Period. And yes, “temporary” in the Stuff headline is unfounded, not fact, Just mere speculation. Who wrote that CSC press release? If you are going to personally attack scientists, you should at least have a decency to put your name to it. It’s a bit rich claiming to be tax-payers when your debt to NIWA remains unpaid. The cooling is relatively minor — less than 2 degrees F (1 degree C) since the 1990s — and it doesn’t negate the background warming that is happening because of the steady rise of heat-trapping greenhouse gases in the Earth’s atmosphere, the researchers said. It is simply masking it for the time being. Eventually, human-driven warming will overwhelm the influence of the ozone hole recovery and natural climate drivers, and temperatures will once again rise. There sure seems to be a lot of natural “masking” going on. Not so much “heat trapping” though. To put the warming and cooling periods into context, the team included analyses of ice core records. These cylinders of ice drilled from Antarctic glaciers can reveal temperature patterns and showed that episodes like these had occurred in the past as the result of natural variations in climate. The warming period, while unusual, wasn’t unprecedented. Nor is the cooling period. That doesn’t mean that greenhouse gas-driven warming isn’t playing a role now, either on the peninsula or on Antarctica as a whole (of which the peninsula only makes up 1 percent). Instead, it means that the large ups and downs driven by the ozone hole and natural variability are overwhelming the long-term warming signal for the time being. If emissions of carbon dioxide and other gases continue, that signal will eventually emerge, likely sometime in the next two to three decades, Turner said. Heh – “natural variability are overwhelming the long-term warming signal for the time being”. I bet they gagged on that sentence. Well before 2050 I would have thought, if the theory had any validity. 2016 would be good. Thing is though, Turner is conceding the human signal is simply not there; it has not “emerged”. It’s the same with sea level rise in the Pacific. No human signal detectable and we will have to wait “decades” for it to “emerge” (apparently). These, basically anecdotal, studies demonstrate why there has to be primary critical criteria – and there is. The IPCC provides it – earth’s energy balance measured at the top of atmosphere, And it is in the critical criteria that the MMCC theory fails. If the human-caused theory has failed in the critical criteria then any secondary study is pointless in respect to a human-caused signal. As Turner at al ably demonstrate. Dr Jarrod Gilbert is a sociologist at the University of Canterbury and the lead researcher at Independent Research Solutions. He is an award-winning writer who specialises in research with practical applications. Heh, “heat-trapping gasses” again. From a Sociologist no less. Expert in radiative thermodynamics of course. But scientific truth is determined by vote now? And refuted papers (see upthread and post) still remain valid?